Anyone who wants the COP Adaptors (to make their own coil brackets) please email me today if you can, as I am organizing next production run of these and will make as many as people want to buy. Thanks. Started on running harness through firewall and bay, so far so good. 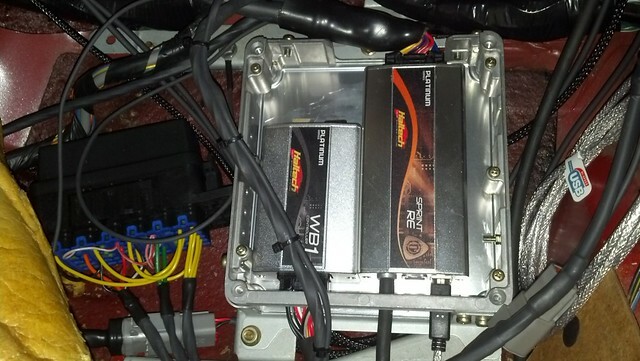 I had enough room to secure both the Sprint RE and wideband controller within the gutted stock ECU. Aside from ease of troubleshooting in the future, is there any reason I shouldn't have my fuse/relay box where it is in the pic? It fits snug in that location and I believe the kick plate will still fit over it (haven't tried yet) so I figured I'd leave it there. So far everything has been plug-&-play without any issue. Can barely see in pic but I secured the water temp sensor on the backside of the pump housing under the thermostat, is that correct? Last edited by FC Zach; 03-02-2017 at 12:04 AM..
Far left connector? If so yes. If you didn't have it already. Looks good zach.... we'll hammer tonight and see how close we can get! Major thanks to the help I had from the locals this weekend, without their help I would have thrown the towel and would have felt committed to driving the daily to DGRR. After finding and correcting one issue after the other throughout the weekend, with both parts and wiring, we finally got a break today. Today we got it to start and dialed a few things in nicely. Tomorrow I need to clean up a few things and then it'll be ready for more tuning. Car was running Sunday, not so much tonight. Nothing has changed except for my battery and/or starter sounds weak. I'll test these tomorrow and replace whatever needs replacing. Also, once again I feel defeated and feel that the 7 may not make it! If that is the case I wont be rotorless. .. The KMS4 will be displayed somewhere at the show. Does it start & run fine with a jump start? If so, sounds like you've got a parasitic electrical load that is draining down the battery over time, as if leaving the lights on. Any new wiring from the EFI setup that is NOT switched (i.e., wired to constant power)? That's the first place I'd look. 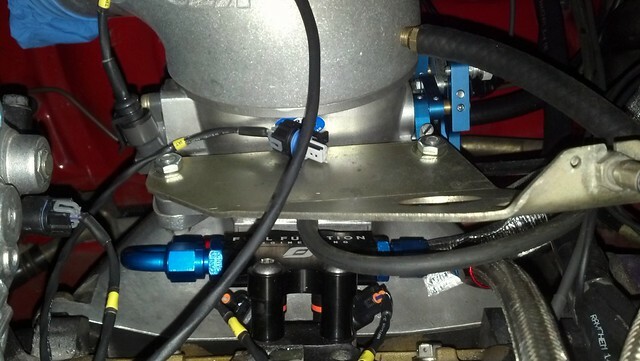 it would be unrealistic to expect several aftermarket parts to plug into eachother and work flawlessly on the first attempt without using your head to do any troubleshooting ever. also, if the issue ends up being your battery or your starter, it probably wouldnt have fired up with a carburetor either. Last edited by jacobcartmill; 04-14-2015 at 12:05 PM..
battery and you are probably good to go. Last edited by t_g_farrell; 04-14-2015 at 01:43 PM.. The battery appeared to be bad according to my trickle charger so I bought another. The car cranked better but still no spark. . Eventually the starter went south and luckily for me the local Advance had one in stock. We tried adjusting the gap between the trigger wheel and sensor, tested voltage to coils, and even attached an OEM CAS to test for spark which gave the same results. Everything but the ignition appears to function properly. What makes this a mystery is that nothing has changed since Sunday afternoon and now no spark.